Balloons bent to look like an animal is something that every child enjoys receiving and parents love looking at the balloon artist in action. 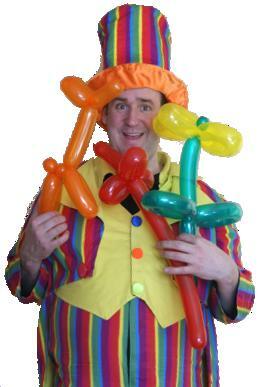 Balloon twisting, balloon modelling or to use a classy name balloon sculpture is having loads of laughs with balloons. The balloon modeller blows up a long thin tube of latex, bends it into baby sausage bubbles and before long it looks like something completely different. This balloon modeller has been providing balloon twisting model artists all over the country for three decades and is an experienced modeller of balloons and capable of twisting balloons into everyone's favourite models including swords, sausage dogs, flowers, puppy dogs, elephants, hats, poodles, head mics, giraffes and swans. For those busy occasions this professional balloon modeller can provide numerous balloon modellers or balloon artists who are able to craft all kinds of designs from balloons that children adore. Children's most favourite balloons are for boys pirate swords and flowers for the girls. This balloon twister is available as balloon modeller for every one of your events and will entertain children young and old holding their attention for ages.